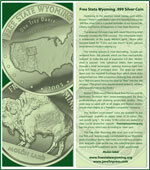 The Free State Wyoming Web site is now up and running at http://www.freestatewyoming.org. Update your bookmarks accordingly! 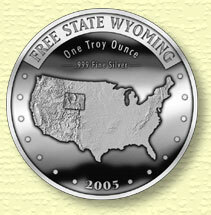 ANNOUNCING THE FREE STATE WYOMING 1 OUNCE .999 SILVER COIN! Our thanks to all who purchased these handsome coins! You've a rare collectible to enjoy — a pocket memento of Free State Wyoming whether you've yet moved to Wyoming or not. If we receive sufficient interest we may contemplate another 1,000 coin mint run, in 2007. 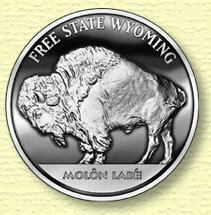 While the reverse (of the buffalo) would be identical, the obverse would feature a high-relief image of Wyoming. Those who wish to contribute some of their own silver in a partnership deal, let Boston know. 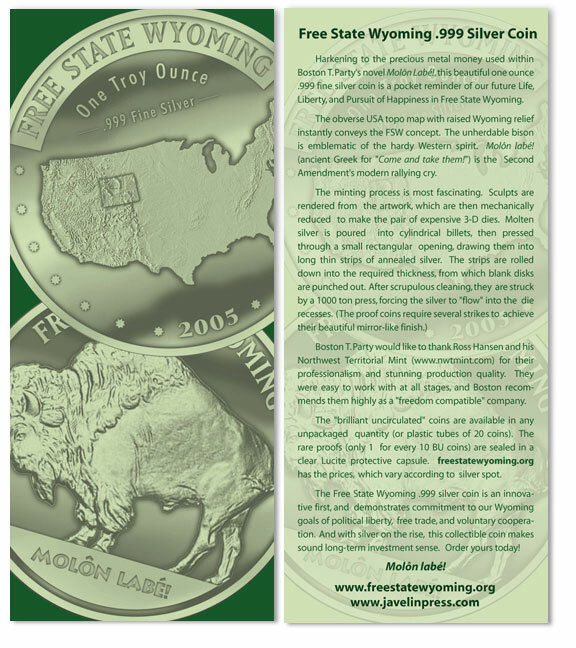 Own a piece of Free State Wyoming in your pocket! And once you've moved to Wyoming, trade it with your FSW neighbors! Effective 25 February 2006, only one coin per customer and address (no coins sold in quantities). Since silver is rapidly climbing and just closed over $13, we now accept orders based on the postmarked date of spot price only + $13 ($10 premium and $3 S&H). 20-coin tubes are SOLD OUT. Proof coins are SOLD OUT. The coins will be shipped in a mailer featuring the beautiful coin design and offering an explanation behind the coins. Click here to see a larger image. The images you see here are protected by copyright. Unauthorized reproduction is strictly prohibited.